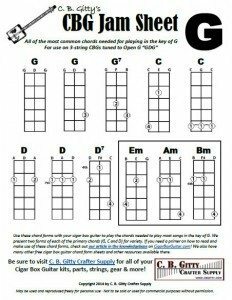 These three printable sheets give you the 3-string cigar box guitar chord forms for playing in the three most common keys: C, G and D. These chord forms are intended for Open G “GDG” 3-string tunings. 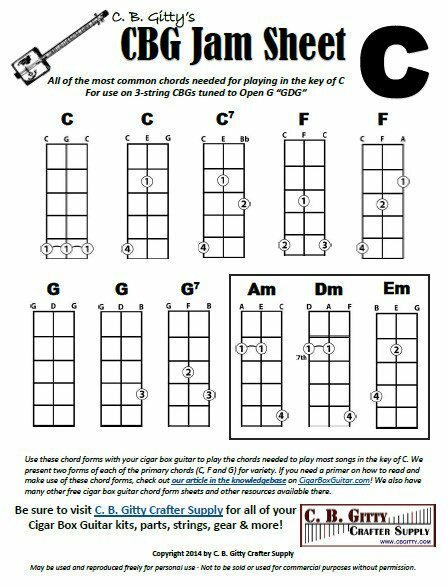 For each of the 3 keys, we give you the major, relative fourth and relative fifth chords, as well as the 3 relative minors and the seventh forms for the root and fifth. 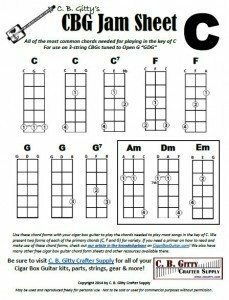 Using these chords you should be able to play the vast majority of popular songs from rock to blues, country to folk, religious songs and more. These sheets are perfect for jam sessions! Click one of the three images below to view the printable PDFs. For help with how to understand and use these chord forms, check out this article. Hey there Willy, sorry for the delay in response here. Ben did a video a little over a year ago on building a washtub bass. Beyond that, we don’t have a whole lot of experience with bass guitars. Do u have any advice on building a upright bass? What hardware should I use from ur store. Hi, I have a FOUR string guitar. Can I take all the tabs for three string and use them for my four string or do I need different tablature? If I need different tab, are you guys working on more songs for for four strings?